As you can see in this year to year comparison, Aquatic Concepts was able to more than double the number of active participants with this client. 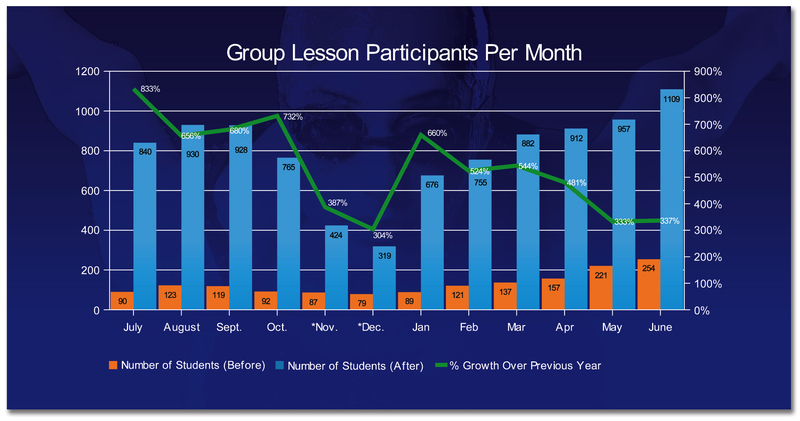 The Orange bars show the number of participants prior to Aquatic Concepts implementation and the Blue bars show the number of participants after implementation of our system. Note the Green line, which shows the same-month growth percentage – the lowest of which is 304%! Aquatic Concepts offers a ‘turn key’ aquatics program which allows the client to purchase the rights to use everything you need to have a successful operation. We customize our templates to reflect your image that will handle every component of running a profitable swim school and help you make them work in your facility! We’re so confident in our system that we guarantee you will have increased profits in the first year. Contact us today for further detail information on this profitable service! We GUARANTEE INCREASED PROFITS THE FIRST YEAR!